In a move that some believed may never happen in California, state legislators approved three bills that would -- for the first time -- regulate the state’s vast underground water resources. “These groundwater bills would be the most significant change in water policy in decades, maybe four decades,” says Lester Snow of the California Water Foundation. Groundwater is California’s “underground reservoir,” providing as much as 60 percent of the state’s water supply during drought years. With this year’s historic drought, groundwater levels have dropped dramatically as farmers and cities have pumped to replace water that would normally come from reservoirs. In some places, groundwater has fallen by 100 feet in the past year, and water wells are going dry. Under California’s current system, landowners can essentially pump as much groundwater as they want to, from under their property. Unlike water taken from rivers and reservoirs, groundwater usage isn’t tracked in many parts of the state. The bills, if Governor Jerry Brown signs them, would designate local agencies to write sustainable groundwater management plans. The local agency could be a single water district, or a coalition of water agencies and county officials, all connected to a groundwater basin. Many of these governing bodies have already been established, as a result of 2009 legislation that encouraged areas to set up a groundwater tracking program. The program was not mandatory. Groundwater basins that are considered in critical overdraft have until 2020 to write their sustainable groundwater management plans, while high- or medium-priority basins have until 2022. Low-priority basins would not be required to participate. After the plans take effect, the local agencies would be required to get groundwater use in balance within 20 years. The local agencies would also be given new powers to enforce the plans. Those include requiring landowners to install water meters to track groundwater use or limiting the amount of groundwater that can be pumped. Whether or not these powers are used would be up to each individual area. If a region fails to write groundwater plans or its plan doesn't meet state standards, the State Water Resources Control Board can step in. The political consensus to pass the bill was galvanized by the dramatic impacts from this year's drought. “Absent the drought drawing attention to this, we would not have this moment,” Snow says. Some regions signed on because the bills prioritize local control over groundwater, instead of giving the state authority. Other agricultural groups remained opposed. 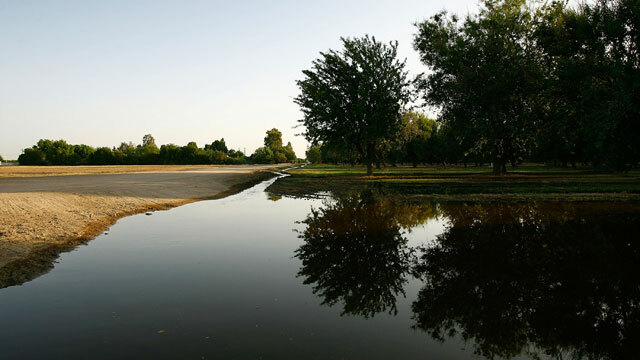 “I hope no one, especially those 120 elected leaders in the legislature, think that they’ve solved California’s water problems,” says Paul Wenger, president of the California Farm Bureau. Farmers that have been using groundwater responsibly until now could lose out under the new management plans, he says, depending on how water agencies decide to limit groundwater pumping. “They will typically look at those that have historic use of groundwater and then if they need to limit it, they will limit you to a percentage of that historic use,” says Wenger. That system would reward the heaviest users, he says. The Governor is widely expected to sign the bills and has until the end of September.